Are you in debt? Do you want a new car or a new house? Do you just want some extra money so that you can take your family on a nice vacation? I think you can answer yes to almost every question above! * You don't need to be a Search Engine Optimization specialist. * You don't need to spend a small fortune on AdWords getting clicks. * You don't need to be a techie. * And amazingly - you can start benefiting right now even if your site is brand new and has no links pointing to it! This site has discovered an area of Google that gets a ton of traffic - but - where there's not much competition... yet. This makes it pretty darn easy for them to get stacks of free traffic from Google. This is just one out of many businesses quietly using the 'hidden' areas of Google to get mounds of free traffic. 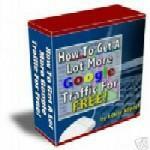 Would you like to start benefiting with these Google traffic secrets too?